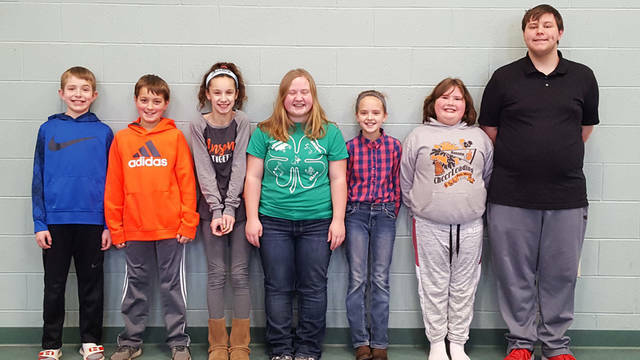 The 2019 Ansonia Animal 4-H Club officer team is (l-r) Byron Young, Kaeden Waymire, Miley Walls, Julie Oswalt, Lydia Hahn, Savannah Oswalt and Matt Slyder. ANSONIA – The January meeting of the Ansonia Animal 4-H Club was held on Jan. 13 at Ansonia Methodist Church. It was called to order by President Julie Oswalt. The Pledge of Allegiance and the 4-H pledge were led by Elise Hahn. Treasurer Matt Slyder gave the treasurer’s report, however, no secretary report was given. All reports were approved as read. In old business, at the December bowling meeting it was discussed that the Ansonia Animal 4-H Club will go snow tubing at Valley’s Edge for the February meeting. The cost will be $15 per person, and a motion was made by Savannah Oswalt and seconded by Miley Walls that the club pay for each member. Any additional persons will need to pay for themselves. The motion passed. Lastly, county medal forms are due by Jan. 18. In new business, election and installation of 2019 officers was performed. Julie Oswalt will continue as president, vice president is Matt Slyder, Lydia Hahn is secretary, Miley Walls as treasurer, Savannah Oswalt as historian, Kaeden Waymire as reporter, and Byron Young will serve as health and safety. A poultry clinic will be held from noon to 2 p.m. April 16 at the Youth Building. The next meeting will be at 2 p.m. Feb. 10 at Valley’s Edge in New Paris.